"Gouge Away is a telling of Samson and Delilah. It's a story that has anger. Do I purge via a song? I don't know. I suppose it's possible." Hey - thanks for checking this out. Hey - you wanna hear what FrankBlack.net members have been up to? 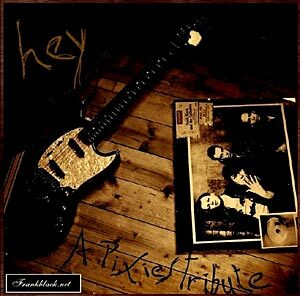 Just like the previous FB.net Tribute 'You Ain't Me', you can download the virtual album 'Hey' off the FB FTP, completely for free! Hey - I think you're gonna like it! What People Are Saying about Hey! I have now listened to "Hey" and it's the most fun I've had in 2004. PS: Seriously, this is the 4th Pixies' tribute album I've heard and it is as good, and in many instances better, than the other 3. "... [we] put the Pixies tribute on immediately and we all love it! It's so cool! And fun! My fave is still the Debaser cover at the start - a great Friday afternoon end of the week version! Ahhhh lovely! Thank you for that!" Visit the Frank Black Forum, sign up, then visit the FTP area. You will need an FTP client to download the album - check out the FTP FAQ for info on this if you need help. (Note: you will not be able to view the area until you sign up and log into the Forum.) The CD Cover and Tray Inserts, as done by Tom Matthews is located on the FTP as well. There are two groupings of songs - the ones selected for the 'Album', and all other contributions, which are listed as 'B-Sides'. They're all encoded as 192kbps MP3's, and the 'Album' tracks have been mastered by Tim Franklin. The MP3s have the track spacing built in so that you can listen to the 'album' on a computer with correct spacing. To duplicate this on a CD, burn disc at once with no pauses between the tracks (you can't remove the pauses unless in DAO mode) to get that same spacing which we meticulously adjusted. Production/Engineering- Tim Phelan @ CRT studios in Arlington, Tx.